This was our quietest month of gaming so far this year, with only 9 different games played and only one of them played a second time (Gomoku — that’s 5-in-a-row to you), but this saw the reintroduction of Magic: The Gathering (only played once, but we spent some good time building decks) and Plyt, which skipped a month of play in June. 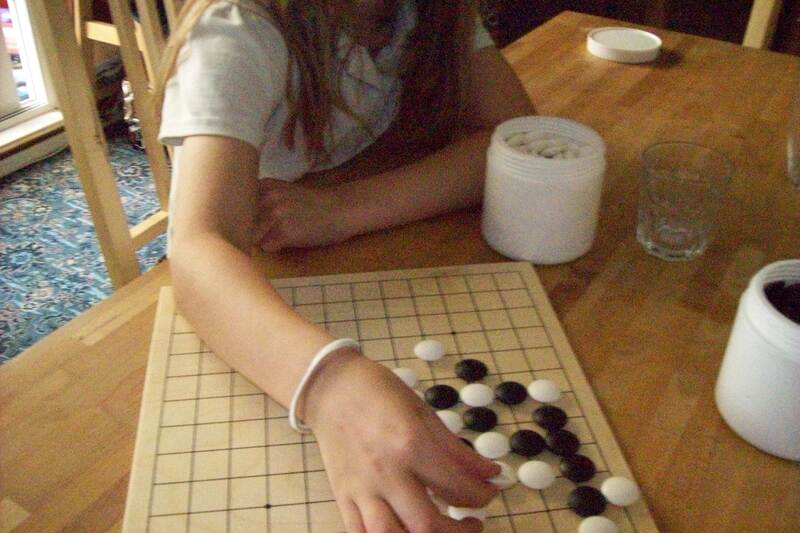 One of these days we will work together to learn Go, but for the time being Gomoku makes good use of the components. Actually that statement about only playing one game more than once is not entirely true. Miss B hassled me into playing One Night Ultimate Werewolf with her. In case you don’t know this, it is an ultra-quick retooling of the classic Werewolf/Mafia game of lying to and murdering your friends, and is really quite good. The thing is that it really needs at least 4 or 5 people to make it work properly and the two of us plus a couple of Miss B’s toys to make up the numbers doesn’t really cut the mustard. So we had some fun going through the motions and had a system for the toys making votes randomly, and did this a few times, but I wouldn’t really class it as actually playing the game. By way of a compromise I have recorded that session as a single play. Miss B is now worryingly keen to play the game with real people. That’s going to be an interesting day. Anyway, all this leaves us with the year’s leaderboard headed up by Love Letter and Plyt on 7 plays each, followed by Dobble with 6 plays and Chess with 5. This year we don’t have any game running away at the front, so there really is everything to play for, and plenty of space for something new to jump in and take over. I think the August plays may be interesting as we will be spending a part of the month away on holiday, so our game playing patterns are bound to be very different. Well, I took GUBS on holiday with us and it rocketed to the top of the charts on 17 plays in July… I can’t say it’s my favourite game (all that horrible luck in picking up cards), but, compared to some other Gamewright games, it does involve building a chain of actions with your cards (play spear to pop bubble, play lure to steal free Gub, play barricade etc), so it does have more going for it than many card games…. Camel Cup managed 5 family plays and I seem to think it is perhaps a better family game than my family do… it’s a lot of fun when played in the right spirit with lots of cheering and chanting! Love Letter (4), Augustus (3) and Gauntlet of Fools (2) all made a bit of a comeback, whilst there were positive signs of better gaming to come when my eight year old discovered Kingdom Builder as an app, declared it his favourite game and we’ve now played it twice in the physical version.